Here’s a great way to truly appreciate the eggplants of this season sourced from the new greenhouse crop currently in your local market. It’s not complicated, looks great, and is delicious! Here’s your list, short and sweet. Turn your grill/BBQ on medium. Slice your eggplants in half, quarters or length-wise depending on the size. With a small knife, score the inside of the eggplant, making a cross-hatch pattern, without breaking the skin. Cut or scoop out the flesh, and dice to about ¼ inch or so. Combine this in a bowl with the tomatoes, cheese, bread and garlic, using the salt, pepper and herbs to your own taste. This mixture should be moist, like stuffing. 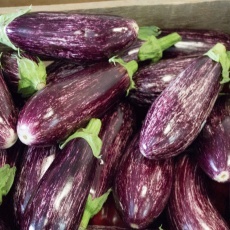 Divide this over the eggplant skins, then sprinkle with olive oil. If you’re daring, you’ve quickly put some nice grill marks on the skins, before stuffing them; if not, that’s fine, too! Using a piece of aluminum foil, or a disposable pie plate, set on the BBQ, and cook until tender and fragrant for 15 – 20 minutes. Enjoy!